Page of Wands (R) says you are experiencing an uncomfortable relationship with a person who is domineering – this person is upsetting you. Face your fears and have the courage now to release them – allow yourself to feel the renewed energy, spirit and vitality. Your eagerness to start something new has been disrupted by complexities, problems and outright opposition which has resulted in confusion and indecisiveness. You have experienced fear and find you are unable to declare yourself. Recognize now that your basic qualities are simplicity and faithfulness and this instability causes you weakness. Choose now to get away from the complexities or develop the maturity necessary to deal with them. This continued indecision will only lead to further degeneration of your resolve and self – confidence. Be willing now to explore the unknown – ignite your self – curiosity and continue to move forward. What new territories and ideas are you checking out? Who is enthusiastic about your endeavors and looks up to you as a mature adult? What actions are you risking to take? What are you all fired up about? In the first position: Spiritual discipline may have been erratic or perhaps confusion with messages, disciplines. Many messages, little witnessing. In the third position: You are the agent through which the Page can deliver his/her gifts. In the fifth position: You may think adversely about this Page or he/she about you. In the sixth position: At one extreme, there may be a retreat by you or by the Page. In the seventh position: You may fear this youth or what he/she represents. In the eighth position: You may reject this child or he/she you. In the ninth position: Your heart may be involved with this child, but rather not be. Or, the opposite, this can be the symbol of your heart’s sadness over this child. 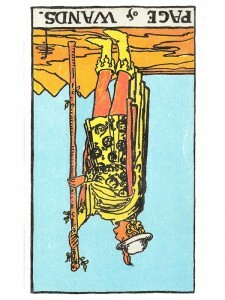 Hello, may I ask what the interpretation of this card means in the second positions? It is currently blank on this update of the website. Thank you.